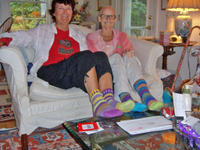 With our idyllic summer of 2007 in Maine winding down to a precious few days, I visited my knitting buddy Joy in Freeport and gave her a pair of what I call "Happy Sox" (www.mollyhutchins.com of Boothbay Harbor, Maine). They're made in Vermont of cotton and nylon and always bring lots of comments. Joy immediately put her new pair on and here we are modeling them.